Found in high-end recording facilities the world over, pyramid acoustic foam is one of the quintessential studio soundproofing and sound absorption materials. Our product offers excellent acoustic properties, great looks and an affordable price point that works for both professionals and home recording enthusiasts. It’s also a great choice for industrial and commercial applications, such as auditoriums, gymnasiums and anywhere else reducing unwanted noise and reverberations is a priority. In untreated rooms, sound waves can bounce off hard walls and create unpleasant reverberations. Acoustic foam works by absorbing these sound waves. Our product’s pyramid shape is designed to maximize sound absorption surface area so soundproofing a room or studio is cost effective and efficient. Pyramid studio soundproofing foam is the best choice for open spaces. Our product is made with professional-grade polyurethane foam and available with 2”, 3” and 4” pyramids. 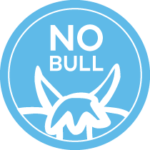 The larger the space you are soundproofing, the more absorbing surface is required — for help choosing the best product for your room, contact a Soundproof Cow representative directly. 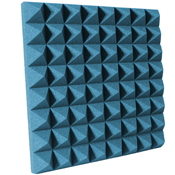 Pyramid studio foam is durable and looks cool, and best of all it can go a long way towards improving the acoustics in a recording studio environment. Our foam panels are sold in 24” by 24” sheets, in packs of 4, 6, 8 and 12, and can be easily installed using a product such as our PL® Construction Adhesive. To meet the needs of a wide range of clients, we sell our pyramid foam in four attractive colors — charcoal, aqua, pumpkin and chocolate. While your choice of color won’t affect the foam’s sound deadening performance, it can play a key role in turning your studio or home theater into an attractive space that’s conducive to creativity and relaxation. Soundproofing a room is a complex topic and, often, there are no easy answers to be found when making decisions about which types of product to purchase. The best way to make the most of your budget is to work with a company you can trust. That’s where Soundproof Cow comes in. Not only do we sell exceptionally high quality pyramid studio foam and other acoustic products, we strive to help our customers make wise purchases whatever their application. If you have any questions regarding studio or acoustic foam, feel free to contact us directly. Or, if you want to know what sound absorption materials will best suit your needs, fill out a free acoustic analysis.